On2 salsa timing is commonly known as New York style. While the old school Paladium-era dancers danced On2 to beats 2-3-4, 6-7-8, the most common way of dancing On2 these days is called “Modern Mambo,” danced to beats 1-2-3, 5-6-7 (the same beats as On1). Modern Mambo was popularized by Eddie Torres and is known for its more sauve feel and complex turn patterns. In the fast-paced world we live in, we want everything immediately and too often this spills over into how we learn, leading us to glaze over the fundamentals and not reach our salsa dancing potential. Taking 15 minutes to better understand turn technique could change your world. A month ago, we cruised over to beautiful Kelowna, Canada with Patrick and Scarlet to teach some salsa workshops on turn technique. At the start of class Patrick and Scarlet asked everyone to social dance, using inside and outside turns, to get a sense of where everyone was at. I jumped in and started dancing with Rina (not her real name). I Keep Screwing Up My Social Dances, What Should I Do? So you mess up. Big deal. It happens to all of us and it happens all the time. If you’re new to social dancing, you’re probably more nervous than the rest of us, but you’ve got to get used to making mistakes. It’s completely normal and very forgivable. How you deal with your mess ups is what really matters. How Much Time Should I Spend Practicing Salsa? 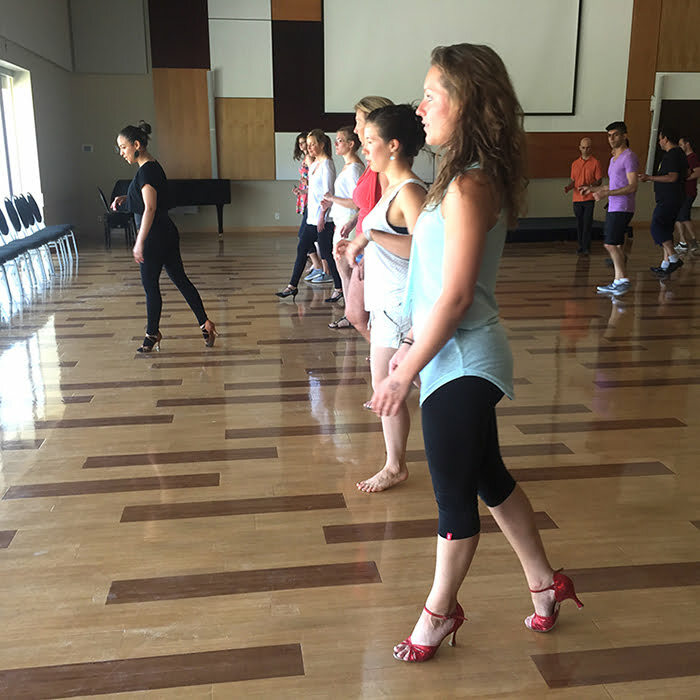 When you’re learning how to Salsa dance, time plays a big role in the training process. It’s important to understand how it affects your learning process so you can decide on how much to practice, how frequently to practice and how you use all that time to get the results you want. Let’s take a look at each aspect of training time to see how it can affect your progress and results. 7 Ways to Practice Salsa Without a Partner and Get Damn Good Doing It! There is no reason you can’t practice Salsa without a partner. Yes, Salsa is a partner dance, but there are often times when you have to hold your own during a social dance. If your partner lets go, what are you going to do? If the music makes a noticeable change, you need to be able to adjust. Would you try a new step during a social dance before knowing what you’re doing? Probably not. Not unless you are comfortable fumbling around until you get it right. And even then you might be able to “make it through” the step. But what about your technique, finesse and posture? Were you getting those right? You have no idea. You were too busy looking at your partner’s pretty face. 5 Funky Salsa Mixtapes to Keep you Movin’ All Night Long! This is just what the doctor ordered. I give you over 2.5 hours of funky smooth salsa music that is guaranteed to keep you movin’, groovin’ and havin’ a great time. Each mixtape has a unique sound. Some are classy, some are party and some are a perfect for practice. Find your favourite, grab a partner and get dancing! For all the ladies out there who are wondering what leads look for in a social dancing partner, this post is for you. Some of these things might surprise you at first, but keep in mind the whole idea of Salsa social dancing is to share an enjoyable moment with someone. It’s not about how fancy you ladies can get with your styling or how many new moves the lead can whip out during a dance. It’s all about having a friendly connection with your partner both emotionally and physically. It’s about walking away from a dance having that feeling of “WOW, I can’t wait to do that again”. We’re not afraid to say it. Nothing beats learning Salsa in person. But what if that’s not enough? Learning to dance Salsa online has some incredible benefits, and it’s by far the quickest way to accelerate your progress outside of the classroom.